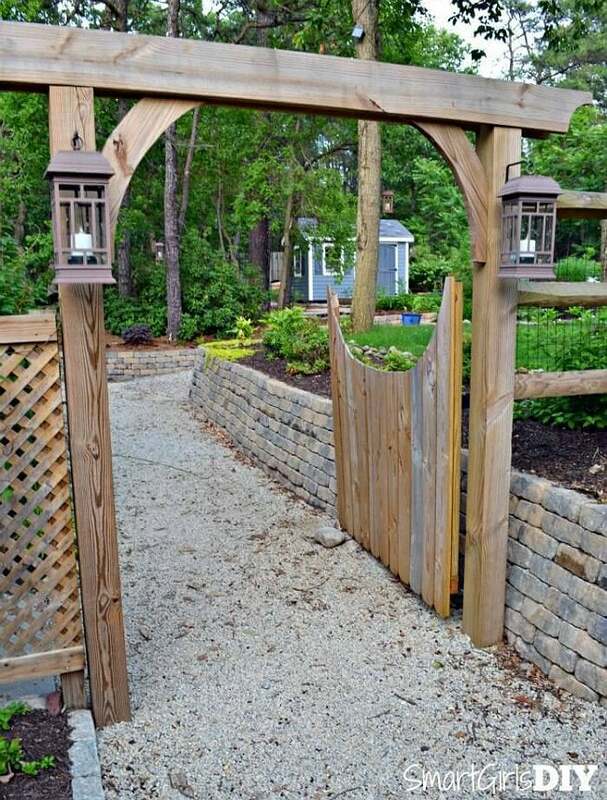 Still on the fence about whether to replace your weathered, style-devoid gate? These DIY yard entrances will make your decision—and the process of building them—unbelievably easy! Adding a fence to your property provides a simple solution for shutting out unwanted animals and nosy neighbors from either front- or backyard. But designing a fence gate that balances the need for privacy with a level of curb appeal that won’t deter the invited guests can be a challenge. These easy-to-build, do-it-yourself fence gates accomplish just that, granting privacy and protection while still enhancing your home’s exterior from any vantage point. If you’ve always dreamed of a white picket fence, ’tis the season to make it a reality—starting with this white picket fence gate from Fry Sauce and Grits. Roll up your sleeves and dig two, 2-foot-deep holes for the fence gate, filling them with pebbles before inserting pre-cut and painted white fence posts. Stylish, black gate hardware complement the row of matching fence pickets for a striking visual contrast. To turn an ordinary driveway into a shady, garden alcove, look no further than this affordable arbor concept. Following the adaptable plans of the makers at Smart Girls DIY, cut pressure-treated wood planks for the arbor posts, headers, and arches. After planting the posts—filling in with gravel beneath for drainage—attach the headers and arches with deck screws. Finish by adjoining a short, fanciful wooden gate that repeats the curves in your arbor for an even more enchanting entrance for guests. This tall and narrow backyard gate featured on Black and Decker boasts a pricey professional quality, but you can make it cheaply—and easily—with this tutorial. Referencing a sketched diagram of your fence-gate-to-be, cut lumber planks for the door-size frame and arches, and deckboards (with their already smoothed and rounded edges) for the gate’s wood panels. Once the joinery is assembled with glue and screws, attach the deckboards to the frame, hang the finished gate with heavy-duty gate hinges, and swing the door open to let in the fun! Transforming a closed and forbidding garden fence into an inviting entryway is as simple as opening your mind—and the door to your shed—to the decorative touch of unused tools lying in your shed. 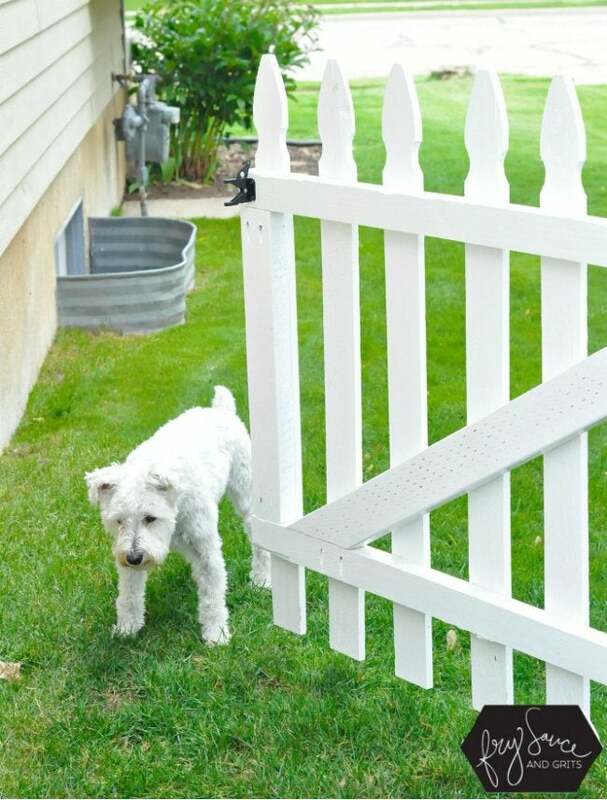 Like the blogger at Montana Wildlife Gardener, tear down your existing fence gate, reserving its wooden boards and screws to erect a new frame. 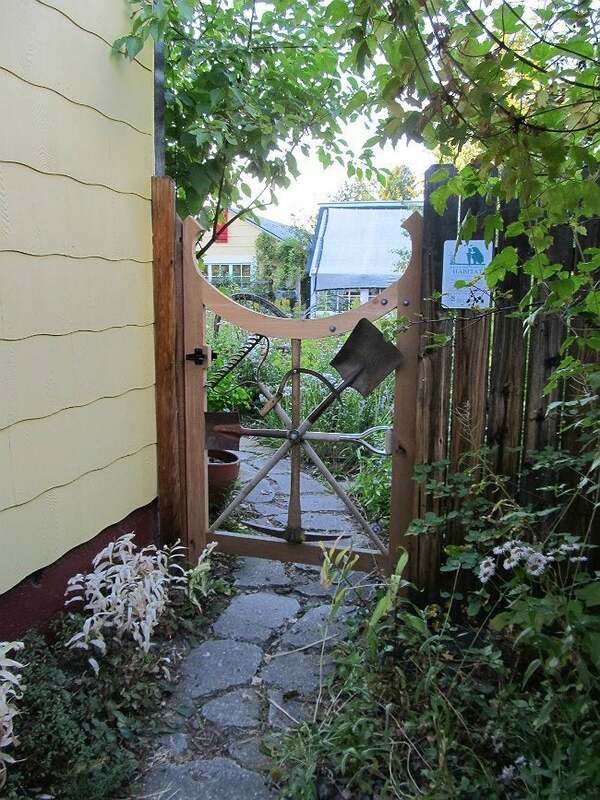 After adorning with a crisscrossed menagerie of repurposed garden tools—from shovels to rakes—your re-tooled garden gate is ready to open wide! Faced with a weather-worn gate that has begun to sag? 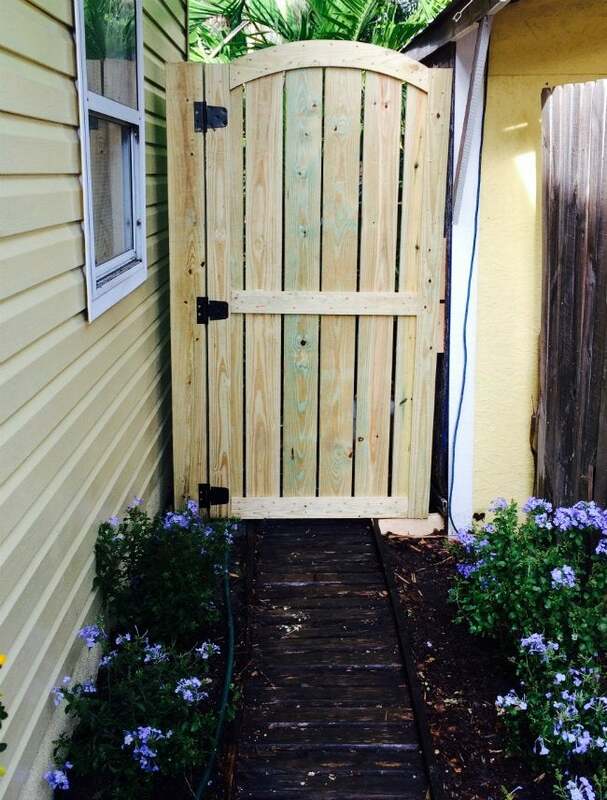 The bloggers at The Cavender Diary turned to a handy fence gate kit for a structural face lift. You, too, can rely on something similar from your local home improvement store to aid you in your DIY project! Once you’ve picked up a starter set, remove the slats from the original frame and set aside to reuse. Then cut pressure-treated 2×4s to create a new, sturdier, rectangular frame, and assemble the planks flat on the ground using the kit’s brackets. 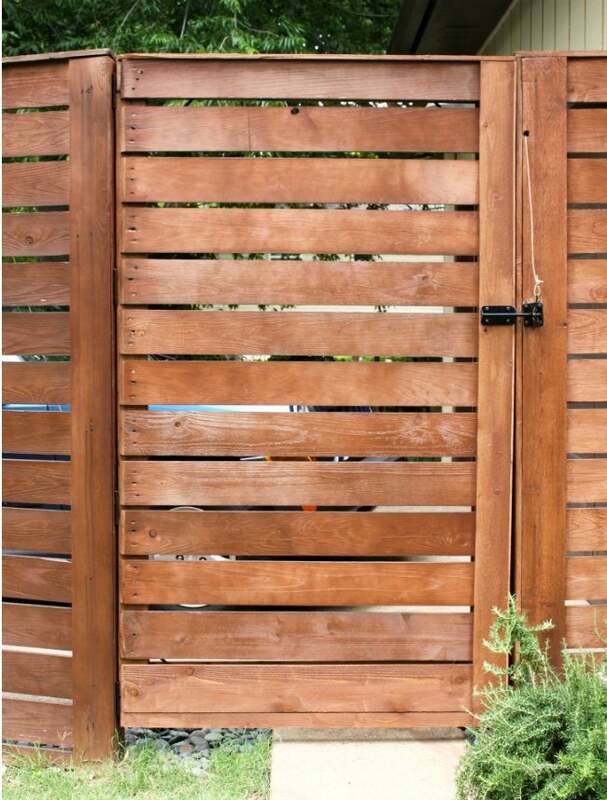 Hang the fence frame in place of the old gate, re-attach the saved slats, and stain for a finished look that’s equal parts vibrant and natural.